Welcome to TunersDepot.com, the premiere shopping site on the web for all your vehicle tuning needs! Whether it be tuning the look of your front end with a new set of CCFL Halo Projector Headlights and matching Halo Projector Fog Lights, or tuning your vehicles performance with suspension enhancing Lowering Springs and performance boosting Cold Air Intakes, we offer a wide selection of parts with an easy to use interface that shows you ALL the parts available for your vehicle by entering the year make and model at the top of our homepage . At tunersdepot, we hope to be your home for one-stop automotive part purchasing no matter which of our main category of parts you are shopping for. By far the highlight of our website is our lighting department. Unlike other websites, we offer multiple brands of lighting products, not just one like our competitors. In addition to our Sonar LED Projector Headlights, we also offer popular brands like KS projector headlights, including their high tech CCFL florescent angel eyes, as well as JY, Winjet, and TM's innovative designs. Our taillight selection is also huge, offering one of the largest selections of now hard to find Altezza style tail lights, right alongside the newest LED taillights from Sonar YD & KS Eagle Eyes (the largest companies), but also from smaller cutting edge companies like Junyan JY (aka TM) and Winjet. Also, if you didn't buy factory option fog lights from the dealer when you bought your vehicle, we have a wide variety of aftermarket Fog Lights from foglight giants X3 and Winjet to fit your vehicle. Also, instead of just the boring clear style offered at the dealer, we have many other styles of fog lights, including other colors such as smoke and yellow, as well as new halo projector style foglight kits with glowing rings to match your halo projector head lights. 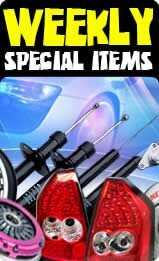 Best of all, unlike aftermarket crash replacement parts, all of our headlights, taillights, and foglights are sold in the COMPLETE PAIR, saving you loads of money over OEM replacement style parts. Unlike most other websites out there, we have a near complete listing of headlight and fog light bulbs, broken down by year make and model just like our other products. 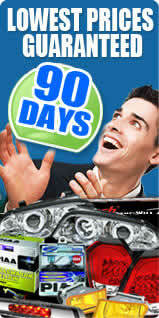 We have a complete selection of PIAA headlight bulbs and Nokya headlight bulbs in multiple applications and colors. And when you are ready for a more serious lighting solution, we offer complete HID upgrade kits for non-stock-HID vehicles. By installing our Tunersdepot HID kits, you will bring your night time drive into a whole new level of brightness. We will also be adding even more headlight and foglight bulb options in the near future. Our website shines in that it not only offers popular lighting options, but also that it has an always growing selection of performance parts. Whether it be trying to lower your center of gravity and decreasing body roll with German made H&R Springs or Eibach Suspension Lowering Springs, or increasing horsepower by installing an AEM Cold Air Intake or a K&N FIPK Cold Air Intake system, we have many options that are available listed alongside all the other parts for your car in our complete year make and model search. Every customer can leave a review about our service and the product that was purchased. In order to leave your review for the purchased product, please log into MY ACCOUNT after you receive your order. We encourage all of our customers to take the time to share their experiences with our website with everyone. We have null reviews with an average rating of null out of 5 stars.